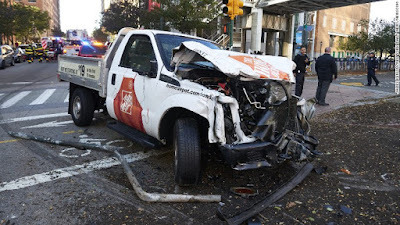 Eight people were killed and almost a dozen injured when a 29-year-old man in a rented pickup truck drove down a busy bicycle path near the World Trade Center Tuesday in Manhattan, New York City. The suspect was identified by two law enforcement sources familiar with the investigation as Sayfullo Habibullaevic Saipov. He's from Uzbekistan in Central Asia but had been living in the US since 2010, sources said. 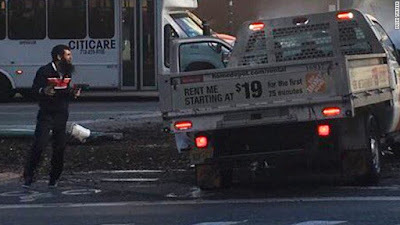 A senior law enforcement officer told CNN a note, written in English, was found in the truck that said the attack, which unfolded around 3 p.m. on Halloween, was done in the name of ISIS. Six people were declared dead at the scene and two were pronounced dead at the hospital. At lease 11 others were transported to the hospital with serious but non-life-threatening injuries. Five of those killed were Argentinians, a group of friends celebrating the 30th anniversary of graduates of the Polytechnic School in their hometown, the country's Ministry of External Affairs said in a statement.